Shorty BillupsSixty Seven year old drummer/singer Shor�ty Billups was born and bred in Boston Mass;. He recorded his first record �Boss Chick�, a Little Richards style rocker, in the late 50�s. He then went on to record twenty odd singles for various labels many of which became highly prized amongst the soul fraternity. As a drummer Shor�ty has been in great demand working with, amongst others, Screamin� Jay Hawkins, Rufus and Carla Thomas, Etta James, Bill Doggett and Oscar Tony Junior. He dropped out of the R&B circuit in the late 80�s to work in the gospel field with the Gospel Conveyors in Atlanta. By 2001 he was back on the Southern Chitlin Circuit and released a CD retrospective of his career �Alone With Shorty� on the Solid Gold Label. This was followed by a set of new recordings �Shorty�s Got The Blues� an interesting selection of blues and soul blues songs. 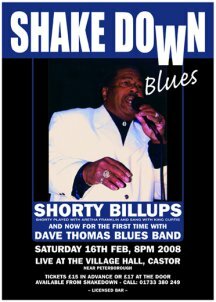 After we had booked Shor�ty for the gig we initially had a problem finding a band that could span the music of the 50�s through to the present day, hearing Dave Thomas�s excellent work with Joe Jonas - and knowing that his long career stretched back to Little Richard�s heyday � the problem was solved.